Josephine Angelini's compelling saga becomes ever more intricate and spellbinding as an unforgettable love triangle emerges and the eternal cycle of revenge intensifies. Eagerly awaited, this sequel to the internationally bestselling "Starcrossed" delivers a gritty, action-packed love story that exceeds all expectations. I've said it before and I'll say it again: I love Greek mythology. Dreamless picks up almost just where Starcrossed left off. Lucas and Helen are 'cousins' and Helen is still getting used to the idea that she's the Descender. And lemme tell ya, her visits to the Underworld are not pleasant. Not at all. And then there's Orion, mystery hand and mouth dude that comes to Helen's aid. The stakes are even higher and this one and the danger is even worse. I felt that Helen's character much improved from the first book. She was stronger emotional wise. Her mind was more stable without the Furies screaming in her ears and a clear goal in her mind. Her badass self, a trait I certainly love to see in YA, was awakened with the truth she was so hard trying to hide all her life. I didn't like her personality in Starcrossed; I didn't find her noteworthy, but she definitely made herself worthy in this book. Now, I have to say. I just have to. I love these demigod hotties! My heart still goes out to Lucas, but I also liked Orion. Although he needed a haircut, I loved his intelligent and kind personality and he was a steady center for Helen, who needed someone sane, even if she could only meet him in the Underworld. They were swoon-worthy boys, indeed. Although I'm not one to go for the macho men type, they had my full attention every time their name was on the page. Yup. Oh, was I hooked on the story. I could not put this book down at all. There was just so much....much to it! Once again, the villains were true villains in all their evilness and darkness. I seriously would not want to mess with these bad guys, that's for sure. And the love triangle wasn't as bad as I thought it would be. It was almost one sided since Lucas and Helen are off-limits from each other, or so they think. Most of the times, love triangles are too soap opera like with all their dramatics and cliches and they do not make me happy. I did not mind this love triangle, surprisingly. My only bone to pick with Dreamless is that I didn't feel as if there wasn't enough imagery. There were moments where I would get confused and would have to reread a sentence or paragraph because it either wasn't delivered right or there wasn't enough description. Then again, there were moments where the description of Helen's house was described beautifully. It was like heaven to my mind it was so perfect. 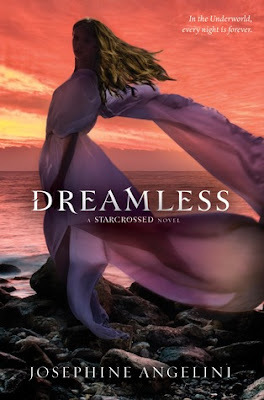 Dreamless is a dark tale of your favorite forbidden romance between Helen of Troy and Paris. It was wicked and captivating, keeping me glued to each page. I enjoyed it even more than I did Starcrossed, getting me really excited for the final installment to the trilogy. My only question is, Why does the release date have to be so far away? I only skimmed your review because I haven't read the first in the series but I just came here from The Teen Book Guru who is featuring a review of the first one and I know I need to get my hands on these books! I love the greek mythology that is finding its way into YA lately!